A box of musical delights? It might be the season to be jolly, but Native Instruments' Christmas freebie is designed to create "sinister, evolving sounds" from samples of vintage toys. 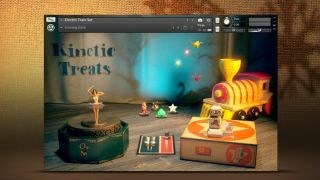 Kinetic Treats can be used with either Kontakt 5 or the free Kontakt 5 Player, and features a 3D interface that enables you to control the parameters by moving a vintage music box and tin robot. It comes from sound designer Jeremiah Savage, and "mangles meticulously sampled sounds into rich, morphing textures which range from the instantly familiar to the unrecognisable." NI has also announced that it's offering all its customers a $25 e-voucher that can be redeemed in the company's online store. The company is running a prize draw to win a load of its hardware, too. Find out more about Kinetic Treats and how to get it on the Native Instruments website. It's available until the end of 2016.